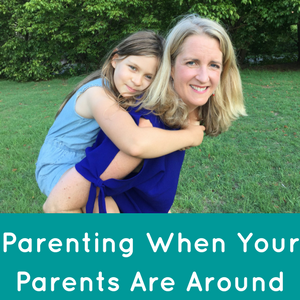 Do you notice how your kids play up when you are stressed? How when you’re on edge that they’re going to do something inappropriate or awful, then that’s pretty much exactly what happens?! Particularly when family members are around who could be critical of what you’re doing?! My mum is currently staying with me for 3 weeks from the UK and I’m loving having her here as I only get to see her about once a year. But it isn’t always easy when different generations & parenting styles combine under one roof..! I was getting more & more stressed, especially as George had just been born, so Emily (aged 6) was adjusting to our different family dynamic and was finding it difficult at times. The more stressed I became, the worse Emily’s behaviour was. I was on edge the whole time. And then the thing I dreaded happened. Emily had a full-on meltdown with my mum at a nearby park. I was at home feeding George and when I went to see them (blissfully ignorant of the meltdown) it was horrendous. Emily was refusing to come down from a high rock & shouting at her. My internal judgements were on hyper-drive: So much for me following a different parenting style. So much for me actually training and then helping other parents to also follow this approach!! Something needed to shift, and that something had to be me. We often feel that – “if only my mum/partner/child/friend would change, then everything would be OK”. But we can’t make others change. And it’s often not what’s actually needed. It needs to start with us. So after I helped Emily come down off the rock, after I’d made Mum a cup of tea (and a stiff drink! ), after I’d talked & vented & complained to my Listening Partner about it all – only then could I reflect on what was going on and what I could do to change it. #3 – shift internally about how I felt about myself, my kids & the way I was parenting. #4 – genuinely relax. It’s so easy to tell someone or yourself to “relax”, but unless you’ve offloaded the internal tension, that’s never going to work. You need to offload the upset feelings, for true peace to occur. #5 – accept that my children are children, with big feelings, including exuberant joy & boiling anger. It’s not reasonable or healthy for them to be ‘good’ all the time. I felt confident and calm. The judgements from my mum suddenly stopped. Emily was warm, loving & happy – no more meltdowns or off-track behaviour. We could all genuinely enjoy each other’s company and have fun together. This year’s visit is going really well so far(!) I’m not seeking approval. I’m not ignoring my child’s needs to please someone else. I’m not tense about how my children may behave. I’m also much, much more confident in how I am as a mum. So I’d love to hear how you manage such situations. And also to help you feel more confident about what your children need, about meeting your own needs, and then about feeling freer from external & internal judgements. To be able to bring more fun to challenging situations and pre-empt off-track behaviour. Next month I’m releasing Transform Your Family With PLAY In Just 7 Days, so keep an eye out for details and be sure to sign up! Until then, if you’d like 1:1 support, check out the details here for my consultations. ← Does your child hate you saying No?